We left Bruges by train and planned to make an afternoon stopover in Ghent to see Gravensteen and have some lunch before the three hour train ride to Amsterdam. I noticed a lot of the locals we spoke with in Bruges actually lived in Ghent and more than one person mentioned that it was a cool city so I was looking forward to taking a look around. It was close and on the way to Amsterdam so why not? We got to the train station in Ghent and were immediately lost outside. This was the first contact we had with public buses/trams so I'm reasonably certain we got away with not paying for any tram fares at all in Ghent due to our extreme ignorance and their system's extreme reliance on the honor system. We got some information from a kind stranger on the tram who should really have run for chamber of commerce king or whatever that office is that totally exists in every city. 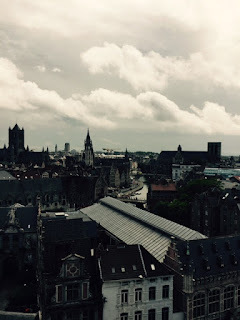 He told us which stop to get out for the castle, pointed out the bar nearby that used to function as an actual gallows (please don't ask me how to pronounce it), and that Ghent was a party city and really, what else do travelers need to know? 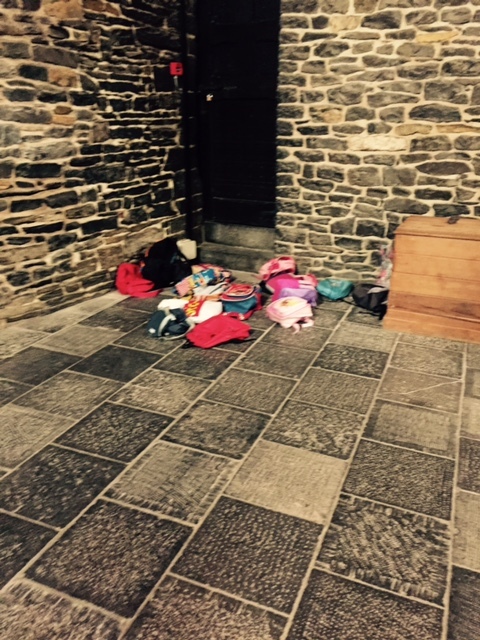 I think only a handful of people were touring the castle along with some school kids. 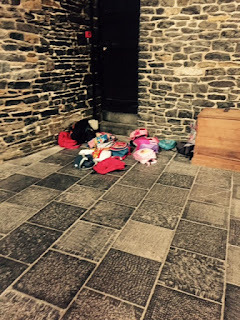 Not that we saw any actual kids, just a creepy pile of unattended backpacks in a pile in one empty room which gave me the willies, particularly inside a castle where a LOT of people were tortured. There is a torture museum in this castle. Here's a photo of me being scared. But like, scared lite. And in my brand new jacket which I haven't lost yet. The whole castle and museum took about an hour to see and after we finished up we walked around a bit. We stopped in a chocolate shop but all I could seem to find were chocolates from South America and I'm saving that for my actual South American trip. So we continued on around the beautiful city, dodging trams and window shopping until we got hungry and stumbled upon this restaurant called Krokantino where I had an Orval, of course, and we had a delicious lunch al fresco and people watched the, and I really don't think I can overstate this, gorgeous, well-dressed people of Belgium. I contemplated staying a night to check out the nightlife but we had booked a hostel for our first night in Amsterdam so it was time to go. The train from Ghent to Amsterdam would take around three hours and change. 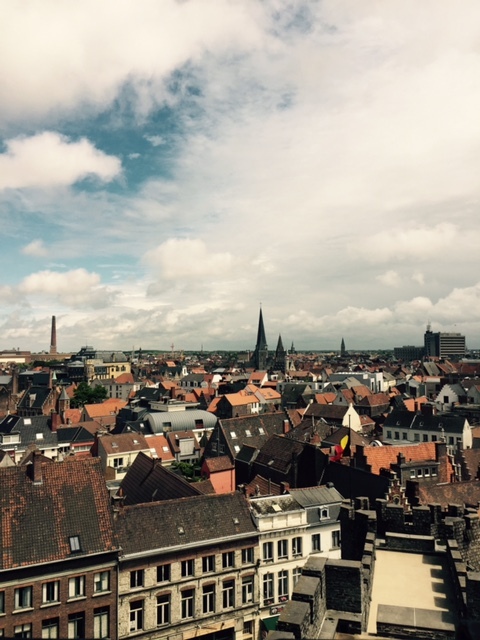 I was looking forward to zoning out and staring at the Belgian countryside while saying goodbye to one of the best places I've ever visited. I'm definitely going back. We got to Amsterdam around 8pm and as we spilled out onto the main drag near the central train station I had a few fleeting thoughts. The first one that flitted by was that it was past 8 and still bright outside. The second was that I might die in Amsterdam. The only reason I thought this was because at the very mouth of the station is an immediate roadway that is shared by the following: cars, motorcycles, bicycles, pedestrians and trams, all moving in one simultaneous rush forward. And I wasn't oriented enough to understand where to cross, when to cross and at what point I should scream in fear for my life. Combined with my travel fatigue and 900 pound backpack and we had an interesting ten minute walk to the hostel. 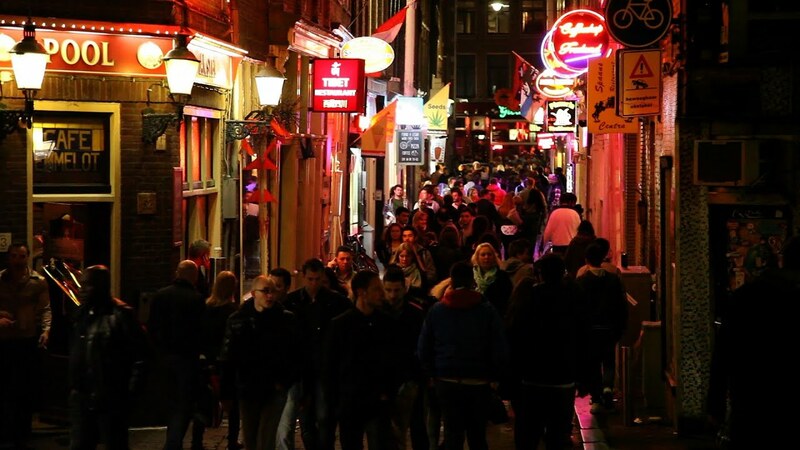 The path to the hostel led us right to the heart of the red light district. For those unaware of what this is I'll simplify: it is a touristy neighborhood of Amsterdam where there are prostitutes hanging out in the street facing windows like mobile mannequins with sad eyes. Aside from all the prostitutes, it is really a lively area of the city which I'm positive I would have appreciated more had I not been lost and worried about being run over by something. At long last we arrived at the hostel which was way more a stereotypical "youth" hostel than the one in Bruges. As the pub crawl organized by this hostel was just outside and things were getting raucous for that group of young drunkards, I thought fondly of my own very recent sojourn to a few bars in the company of strangers. As I heard a loud belch that greeted us as we entered the very loud bar adjoining the hostel, I realized that everyone is the same. And that one pub crawl a year would do for me. ...but it may as well be. Just picture this plus a downpour. And we walked (quickly) to what we assumed was the end of the neighborhood and decided to turn back to get dry and warm. We did find a cone of fries which the Dutch apparently fry twice in order to get that flavor of fries that is, how shall I put this eloquently? Effing delicious. We ended up back the hostel's bar where it was loud and crowded and full of fellow foreigners. We had a few drinks and the most notable thing about that bar was the, what I'm assuming, very, very high bartender who was so manic, quick and gruff that watching him bounce around the bar was like watching a video on fast forward. Also, he picked his nose quite a few times. Like digging for gold style picking. We decided to leave after seeing that and went to a place right down the street. It was a lot less rowdy in there and much more my speed. We ended up talking to a German guy with dreads (a very popular style in that neighborhood, apparently). I also encountered the biggest man I've ever met in my life who was an 18 year old from Mississippi who plays for Ole Miss (I still have some Louisiana in me and I know how big of a deal that is). He was sort of wandering around Amsterdam with some friends and a family member he told us was a male model but we never did see the guy. He was adorable in that "I'm 18 and far away from home and I need to talk to and see everyone and everything." He was literally approaching everyone in the bar at that point and when a 7 foot something extremely large man approaches you, you remember it. I also had a very, very long conversation with an Irish guy named Aaron while Lauren and his friend played pool. He was one of the smartest people I've ever met and we talked about Ireland and New York and politics and Samuel Beckett and F.Scott Fitzgerald and we bonded over bringing too many books with us on our respective trips. If my life was in fact a romantic comedy, this would have been the meet/cute. And my life IS a movie, it's just not that kind. The title of my movie is "Too Old and Drunk: A Non-Romance." Still, I wish I had gotten his last name because he was really nice to talk to. So we said our goodbyes at around 5 am and naturally it was bright as noonday outside. Our room was a two minute walk away and naturally all of our bunkmates were sane and fast asleep. The only issue was that there was a warm body in my bed. Convinced I had the wrong room/bed I just stood there for a moment, staring at the mowhawked head that lay snoring atop my pillow. Lauren poked him with her finger and he apologized for sleeping in the wrong bed but that it was "too dark" in the room so he got lost which I thought was funny. Luckily his bed was empty and I just crashed in that, fully dressed, for about three hours before we had to check out and head to our apartment. It was a very fly-by-night stay in the hostel and as we packed our stuff up I met the guy who took my bed and he was a very cool guy from South Africa so I forgave him. Plus, I had neither time nor energy to hold a minor grudge; there was another waffle to consume and Amsterdam to explore. The riverting, gripping journey continues in the next post which promises adventures in museums, canals and mispronouncing Dutch. Whatta cliffhanger.